Today I wanted to share some fun Facebook tips that I believe most small businesses should try and incorporate with their Facebook marketing. 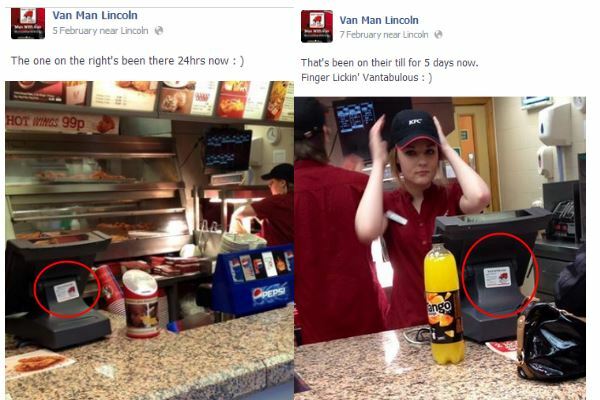 I am going to use one wonderful example by showing you what Mark the Van Man Lincoln regularly does and I can tell you that many of his posts have me and my better half laughing. Unlike other local businesses like Cake Makers or Furniture makers Mark cannot share pictures of recent products he has made or has for sale because what he has to sell is his service of van hire and delivery. Sharing pictures of your products is a great way to get people to know more of what you do but what do you do if you do not have any products to show? You need to become more creative and have fun. I can tell you that we have used Mark to deliver a couple of sofas for us which we bought on eBay and he will be our first choice if we need anything big delivering again and that is because we ‘Know of him’. Yes we now ‘know him’ from using him but what I mean by ‘know of him’ is that his name and services are securely ‘lodged in the front of our minds’ because of his Facebook posts and interaction. If anyone asked me if I could recommend someone who can move furniture or deliver large items I would point them towards Mark Van Man Lincoln because he is the first person I would think of, I know him, I know what he does and I know how I or anyone can get hold of him easily. Mark has fun with Facebook and he engages with people in fun ways and he has also shown me a great way to use business cards today. You might think that business cards are last year’s business accessory that are no longer viable today and that Facebook and Twitter are the way forward and they are to a degree but Mark has gone one step further and created a guerilla marketing approach to using both business cards and social media with the strategies from https://the-indexer.com/digital-marketing-agencies/. 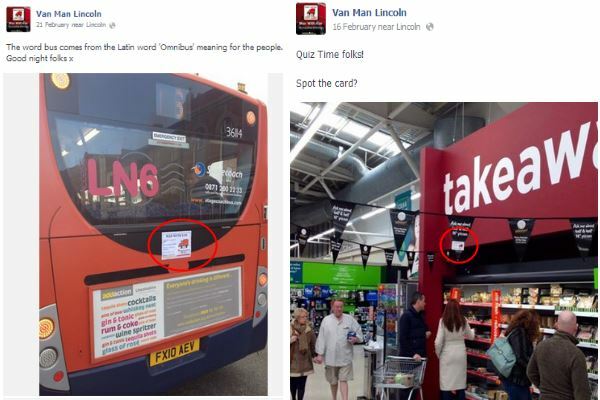 Cards appear on buses, in shop windows and even supermarket bunting. I love this one of his local shop keeper; he has appeared more than one. Mark has posted cards and gone back days later to see that they have been untouched and still where he left them. 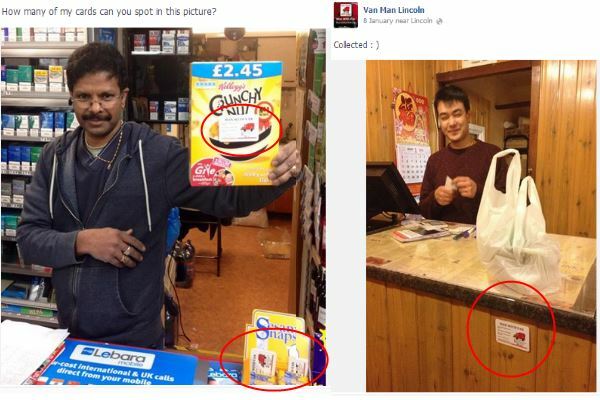 This is good because the person buying a burger at Burger King, chicken and fries from KFC or anything from Tesco might see his details and that is great exposure for a local small business but even better it gives him another fun photo opportunity. Mark also uses Facebook’s Place’s system to ‘check in’ and post status updates saying where he is going and what he is doing which shows how far he is prepared to travel and I know that he travels the whole of the country. This bit is very surreal; when he delivered the sofas to us and we got chatting he told me that ‘tomorrow’s job’ had him driving down to the south coast of England towards Portsmouth. The following day on his travels down south he ‘checked in’ on Facebook that he was at Farnham Castle in Surrey, I lived and worked in Farnham and had only recently moved back from there, I know it very well and was just a little surprised at the connection. It is nothing I know but as they say… small world. Anyway, Mark often shares status updates which show that he will travel the country and that he isn’t just locally based. He will also share photos of some of the items he delivers and where they were bought from so people can get an idea of what he is prepared to do. 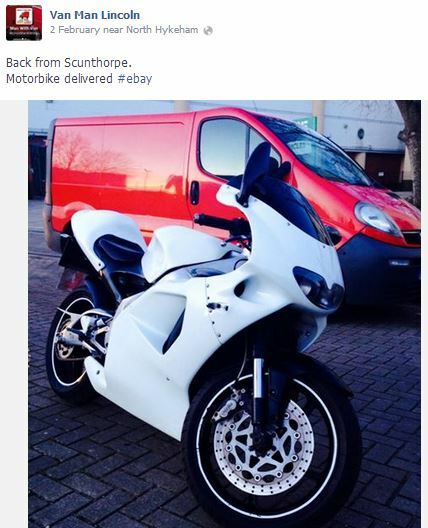 As you can see in the image below Mark delivered a motorbike which was brought on eBay. Mark also adds some fun to his page by sharing part pictures of music album covers and asks people if they can guess what the album and artist was. This gets people replying and often chatting with each other. I recently sent him a message on Facebook saying that I loved his pictures and was planning on writing an article about him; part of his answer was that he just wants to have fun with his posts. This I believe is needed today; too many people are posting ‘woe is me’ style posts which are depressing and moaning. 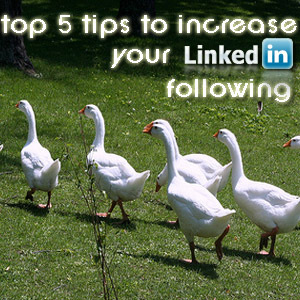 Many are posted simply in the hope to solicit compliments or the offer of help or company from friends. This usually works for a few times then just gets plain annoying with friends eventually ignoring these types of ‘Bat Signals’ as I call them and in some severe cases people will hide the posts from certain friends or even unfriended them. Mark knows full well that fun and helpful is the way forward, we got to know about his Van Man services when my better half was looking for a sofa in the local Facebook ‘things to buy and sell’ groups. Mark often goes in and comments on the bigger items that are being sold. 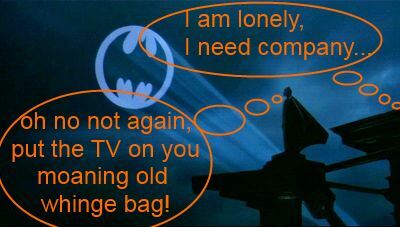 For example we saw him commenting on a sofa saying that if anyone needed it being delivered then he was your person. Sofas are big and not everyone has a vehicle that can take big items. I myself have a Fiat Doblo which has a big boot, it can take so much but we certainly cannot fit a large sofa in it. We eventually found a great deal on eBay and bought two 3 seater sofas with a large pouffe. We just knew who to contact to arrange collection and delivery of the item from Lincoln to Gainsborough which is roughly 16-18 miles away. Mark is pretty busy in these local groups, he will share posts that he thinks he can help with such as larger items and he will also share things he sees when out and about. 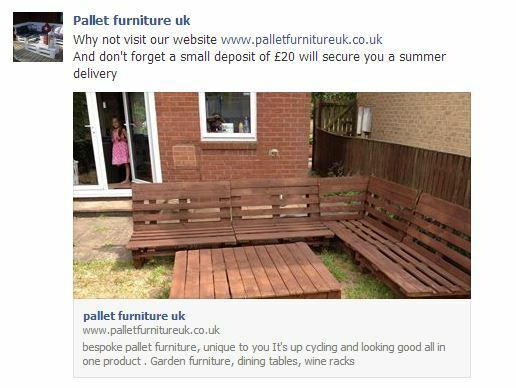 For example he has taken pictures of furniture in shops that are drastically reduced to clear. People may want a new wardrobe and cannot afford the full asking price but if it has 75% off then they might be interested and if they do not have a car big enough to collect the item… who posted the information? 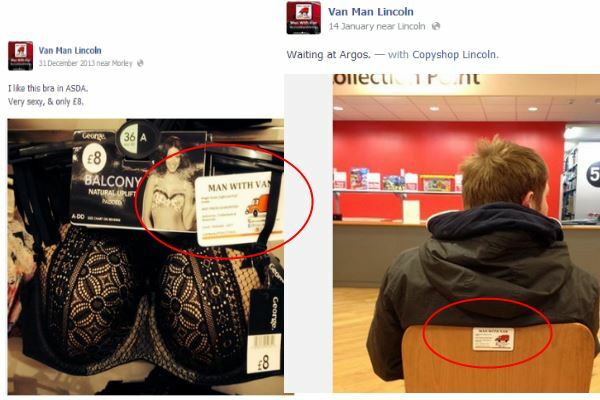 Van Man Lincoln… and what does he do? He has a van which will easily accommodate a large wardrobe. What a great way to drum up possible business. Mark has embraced the modern mobile phone, we can take pictures and uploaded them to social media networks within seconds which is fantastic and something many smaller local businesses should be utilising. I have taken a leaf out of Mark’s book and recently took photos of my uncle and I fitting some doors. As I am a trained carpenter and joiner I gave him a hand for the day and I took pictures of various stages as we worked. 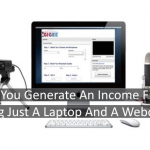 I cannot say whether this will result in generating more work for my uncle but it took me a few seconds to do and it is free advertising, why would we not want to utilise that? The post resulted in getting likes and comments from friends and family living overseas within minutes. I don’t need to tell you how powerful that is. Only last night I was asked if I was back in the building trade because someone had seen that I was working with my uncle. That conversation had come about from those pictures. 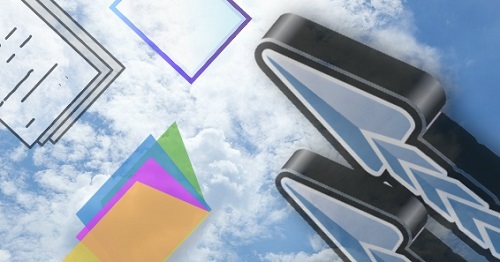 It works and again I must stress it is free to do and takes only a few seconds to share pictures from a phone. Remember Facebook is ideal for creating local networks as it is Geo specific, it gives us a fantastic free tool for networking with people allowing us to show what services we offer, why would you not want to utilise that? 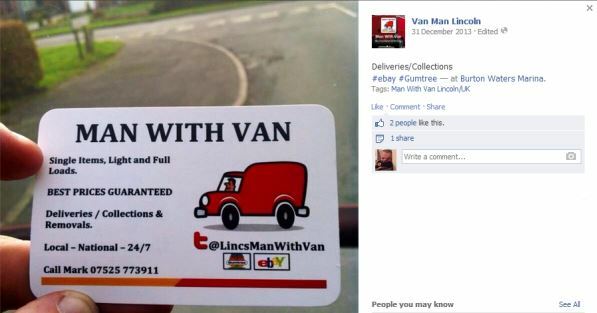 Doing it in a fun and light-hearted way just like Mark the Man with a Van from Lincoln does will benefit you greatly. Mark appears to always be busy, he doesn’t just rely on social media, he does use flyers and business cards as you can see but I am sure his use of Facebook helps him a lot. Especially to connect with clients, that is one thing you cannot do very well with a business card unless someone rings you. One thing I will say as I draw this to a close, Mark will reply and contact you if you contact him and that is what social media is about. Last week I contact our local vets through Facebook and have so far not had a reply, if you insist on using Facebook use it properly. Do not post pictures of your business services or products without any fun, personality or more importantly… any response to people who comment or contact you otherwise you will cause your business a lot of harm. 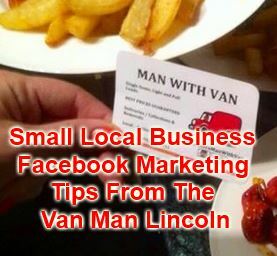 If you have a small local offline business then I suggest you start to use Facebook the same way Mark does and embrace the free advertising it can offer in a fun way. 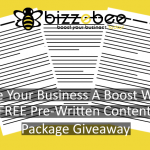 If you do implement any of the things you have read here today we would love to hear from you if you had any benefits and successes from it. 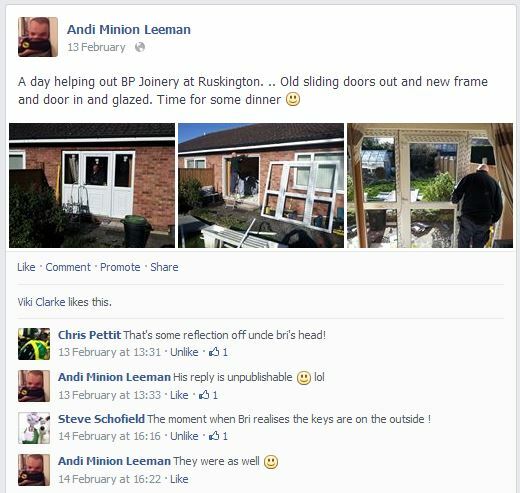 I think this is an excellent case study and example of how a tangiable local business can make a good success of social media. 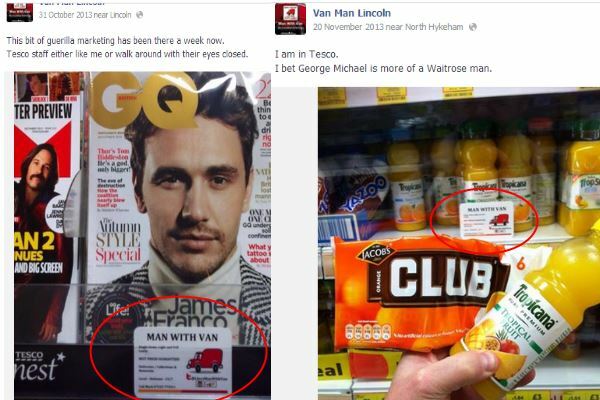 One thing that strikes me as standout, is that your “man with a van” is actually a personal profile, rather than a “business page” – which means, everyone he’s connected with is seeing his updates via Facebook – which as a page he wouldn’t have the luxury of for free – for a lot of business owners, utilising the personal profile isn’t viable – but having read this I can see the REAL benefit in people using this loophole to fit their business needs. Hi Clair, yes, it is a personal profile and should not be used for business technically which I believe is a stupid ruling because work is an important part of most people’s lives however if like Mark you use it in a fun way and not just work related then I cannot see it being an issue. Most people are self employed and wouldn’t benefit from having a brand style business page and as you rightly say people do not see the statuses like they used to. At least when you use your personal profile you are creating a real network of friends, family and clients who want to friend him. 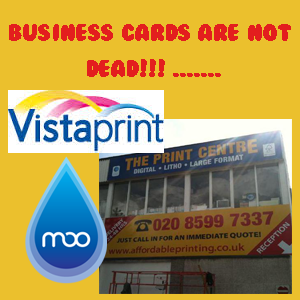 Good luck with the move and have fun with the guerilla style marketing you are planning, I look forward to seeing the pictures and I guess it is pretty handy being able to print your own cards and leaflets… what a great example for your business too! Excellent example, especially well summed up with the response you we’re given from Mark at the end. Hi and thanks Alex. Yeah the response was just legendary and an excellent example on its own. I still haven’t heard from the vets and yet here is mark interacting with people from his phone whenever he can. I get the feeling he will never be without work. This type of guerilla marketing is a great idea for businesses. It’s easy to gloss over many adverts simply because we are bombarded by them all the time, so any way in which to make it stand out from the crowd is a good step. Solid advice and an excellent example! 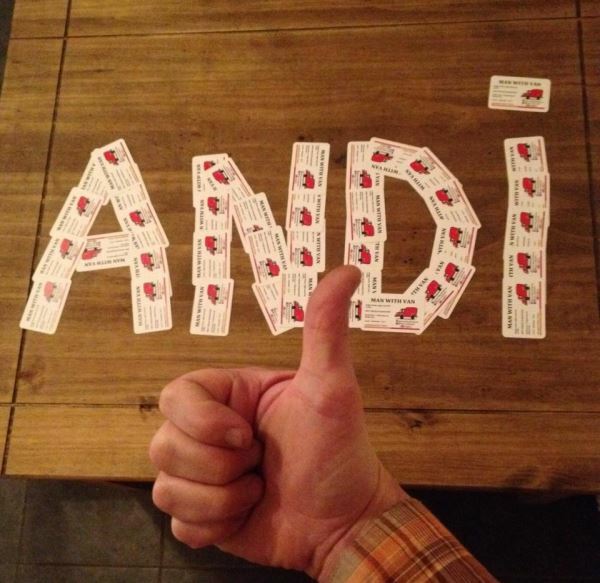 Great post Andi and top stuff from the Man With a Van! Although this man is obviously funny, it’s not a great example as the product he is selling is nothing, just space and time to move an object from one place to another. When an actual product or service are offered to the majority of people they would be scared off by the total lack of professionalism and want to look elsewhere to handing their good money to a Looney. He may be able to get by on humour alone, but I’m affraid that the only places he’s going are delivery destinations.